Carroll Baker with Eli Wallach, making his film debut in "Baby Doll." Archive photos. Yours Truly is attempting to get herself sorted to attend a VIP reception before the awards ceremony. I am fielding questions from a young woman at the check-in desk when I feel something tugging at my purse. Initially, I ignore it – until it continues. I pause mid-sentence and glance down at the table where my purse is resting. Beside me an elderly gentleman is pulling at its chain handle. I gape, then look closer, gaping again. “Eli Wallach, you're trying to steal my purse,” I exclaim with a mixture of surprise and glee. He does not deny it. He looks to have a gleam in his eyes. It would not be inaccurate to say they are smiling. He simply smirks, looking up at me like a mischievous puppy caught chewing on a forbidden slipper. I'm thinking he's probably a little surprised that a young whippersnapper like me knows who he is. I am smiling at this mischievous puppy as I introduce myself. “What are you doing here,” I ask. “I'm presenting an award,” he gives me to know, taking that moment to introduce me to his daughter and son. The children and I quickly exchange pleasantries, and I return my attention to Mr. Eli Wallach!!! Now fully flabbergasted and giddy by half, I say, “I just saw “The Good, the Bad and the Ugly” the other night. It's one of my favorite westerns.” (See video above). “Give him my regards, and thank you for all of those fine films.” I am gushing, blushing and doing internal cartwheels and somersaults. We exchange a few more words I do not recall and say our goodbyes, wishing each a good evening. I still cannot believe that I met Eli Wallach. 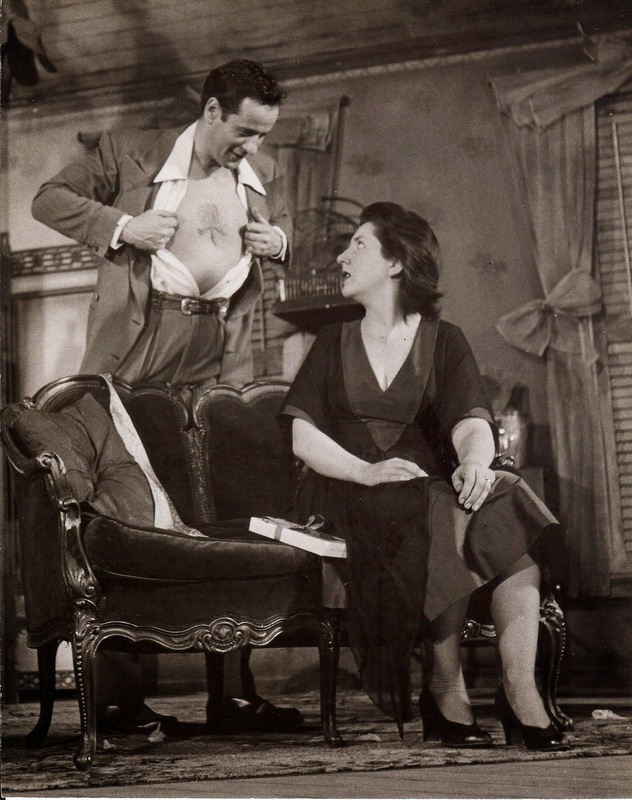 Eli Wallach and Maureen Stapleton on the stage in "The Rose Tattoo," for which EW won a Tony. His second most known and very first western was “The Magnificent Seven.” Invariably cast in supporting bad guy roles, EW always managed to grab some spotlight for himself – seemingly without even trying. The award-winning actor is just as much the star in the last film in Sergio Leone's spaghetti western trilogy as Clint Eastwood, though he felt out of his depth. “ … Clint was my mentor. I knew nothing about making an Italian movie," EW said of the experience. Similarly, EW is a major player as Calvera in “The Magnificent Seven,” with Charles Bronson, Yul Brynner, Charles Coburn and others. In fact the film may have stepped away from Akira Kurosawa's source material and been named “The Magnificent Eight,” so deliciously wicked and riveting is EW's Mexican bandit. EW will remain alive through his work, most notably his films. Over the next few weeks tributes are to be expected. Among the films in the "TCM Remembers Eli Wallach" festival are Kisses for My President,” “Act One” and How the West Was Won. “I always end up being the evil one, and I wouldn't hurt a fly,” the actor once reflected. I believe that about the man who once upon time tried to pinch my purse. Visit http://www.bit.ly/1jBiiiM to learn more about the "TCM Remembers Eli Wallach."